This is the 39th annual PMC and our 19th PMC. Carl rode a “true” Pan-Massachusetts Challenge, beginning in West Stockbridge and heading east to Provincetown over three days in honor of his recently departed uncle William Ormsby. Ormsby supported us for a week of our 2006 Transcontinental Ride, from Big Sky, Montana to Custer, South Dakota. This year’s ride was hot and humid on Friday (as it often is), with thunderstorms chasing the riders all day Saturday and torrential downpours through the evening, but with Sunday beautiful and cool. In spite of the various obligations that life brings (for instance, we had two kids among us when we started in 2000 and now we have six spread from college-age back to kindergarten), we remain committed to this exceptional cause and we ask for your support. The Dana-Farber Cancer Institute is one of America’s finest cancer research and care centers (repeatedly ranked in the top 5 by US News and World Report for cancer care, and well-ranked by Charity Navigator for its efficiency with your contributions), and your gift allows Dana-Farber to do cutting edge work in the field. With the support of our generous donors, over the past 18 years we’ve raised about $700,000 for the Dana-Farber Cancer Institute’s Jimmy Fund. 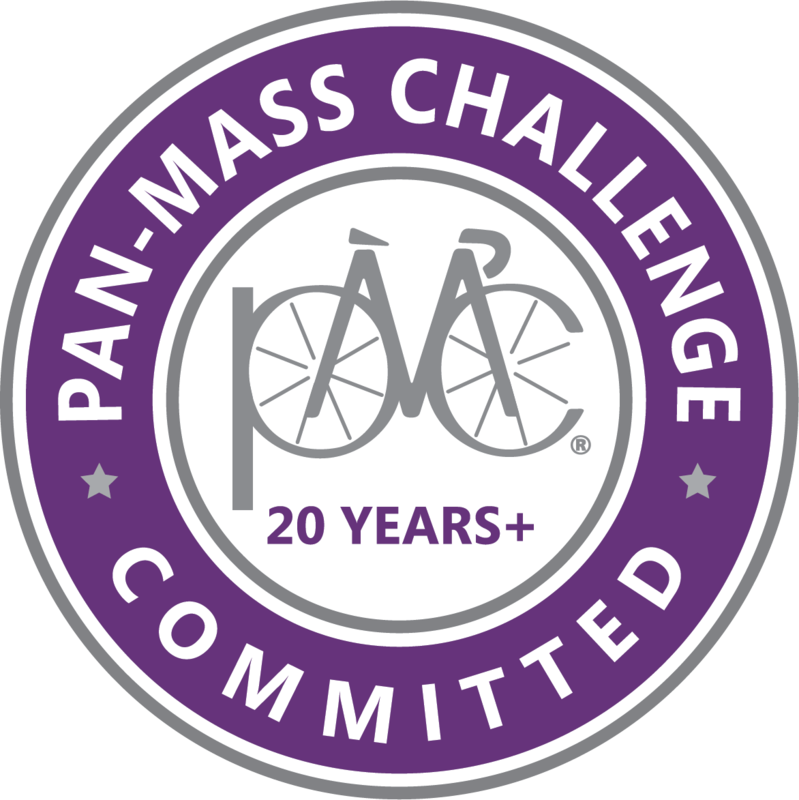 - 2017: Mike and David rode the shorter (160 mile) two-day PMC from Babson College in Wellesley, MA to Provincetown. - 2016: Carl started in Stockbridge for a “true” Pan-Mass, and David joined him in Sturbridge for a full “classic” PMC to Provincetown. - 2015: David rode a 1-day PMC from Sturbridge to Bourne, and Carl volunteered with his family at the Nickerson park waterstop on Day 2. - 2014: Carl rode from Stockbridge to Sturbridge, then volunteered at the Nickerson waterstop with his family. David and Mike rode the traditional PMC from Sturbridge to Provincetown. The Saturday ride was the coldest and wettest in the history of the PMC. - 2013: Carl rode a true Pan-Mass from Stockbridge to Provincetown, and David joined him for the traditional PMC from Sturbridge. - 2012: All three of us rode a very hot traditional PMC from Sturbridge to Provincetown. Carl got an early start from Stockbridge. - 2011: Carl rode a true Pan-Mass with the Huckleberry group, starting in Stockbridge. - 2010: David and Mike rode an uneventful PMC. Carl rode with the Huckleberry group from the NY/MA border to the Sturbridge start. - 2009: Carl and Mike rode a smooth PMC, while David nursed his shattered elbow. - 2008: Mike joined Carl and David for a successful, two-day Challenge. - 2007: Carl rode from the NY line. David joined him in Sturbridge for the formal PMC. - 2006: Transcontinental. Almost $170,000 raised. 3,600 miles over 38 riding days during one of the hottest summers in recorded history. - 2005: Carl and David rode a bit more than the official PMC route, clocking 215 miles and adding CT to our list of states ridden. - 2004: in celebration of the historic 25th annual PMC, Carl and David rode from David’s then-hometown of Cincinnati to join the PMC - a total of 1,054 miles over 11 days! (And no, you don’t want to know about the saddle sores). - 2003, 2002: Carl and David rode about 300 miles by adding an extra day and 100 miles, starting from the MA/NY state line. - 2001, 2000: Carl and David rode the official PMC route, 192 miles from Sturbridge MA to Provincetown MA over two days.